February | 2018 | What is ML Reading? 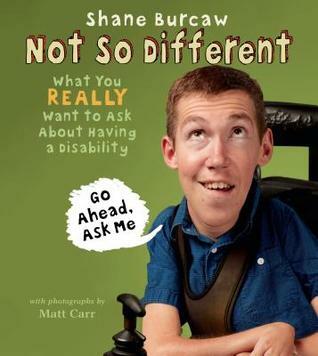 Not So Different: What You Really Want to Ask About Having a Disability by Shane Burcaw and photographs by Matt Carr is a must read. If I was in charge of the world, every third grade teacher would be required to read it to her class. Shane answers questions kids are curious about; but may not ask out of fear of offending someone. You know . . . how one eats, poops showers and moves. The crisp photographs show Shane’s just another guy who needs to do some things differently. However, don’t wait until third grade to read it with your child. I want it required reading in third grade because this is when children start becoming more self-conscious about appearances. Shane is awesome. The sooner you meet him the better. Last year, I read many books that were included on various Mock Newbery 2017 lists. This year, I haven’t read as many books. Usually, the awards are presented in January. This year, they will be presented February 12th. So I still have a 18 hours to read. One’s I’ve read and finished from Mock Newbery 2018 lists are below. I’ve tried to read around 10 books I’ve seen on many lists. However, I only have so much time between work, home and hoursmothering. The book I most want to win is The War I Finally Won by Kimberly Brubaker Bradley. It’s a sequel; so I doubt it will. The first book, The War That Saved My Life, was robbed in my opinion. It received a Newbery Honor last year. It should have received the Gold. Everyone I recommended this book to from age 9 to 92 loved it and couldn’t wait for the sequel.